Movie makers are allowed to be a little derogatory about their own films. So let me admit that After The Bus Had Gone is a perfect example of making a silk purse out of a sows ear. When you dissect it into its separate parts they are all fairly basic. It is only their combination that (hopefully) provides five minutes of entertainment. It started when my son Stephen became engaged to Anwen, a lovely girl from South Wales. Linda and I went down there to meet her family. We stayed for a couple of days in Laugharne, and wandered round this small town with our son while Anwen went into Carmarthen to try on wedding dresses. The town is not the most inspiring for a film. 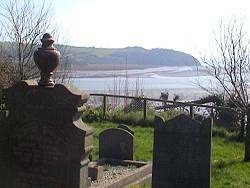 There is not much there except a long high street, a ruined castle, a cosy pub, a beautiful tidal estuary and a quiet hillside cemetery. However this is the town that Dylan Thomas spent most of his short creative life in. 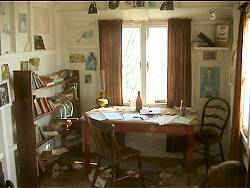 We visited the boathouse where he lived and the clifftop shed where he wrote his poems. I bought a biography of Dylan and the text of his most famous work Under Milk Wood. We visited his favourite pub and his strangely poignant grave. We stayed in a guest house dedicated to his memory and enjoyed the numerous framed photos. As I sat in bed reading I thought there might be a story to tell. The following lines, describing the moonless night in the small town is a ready made storyboard. The inspiration was obvious and I quickly realised that if I was going to start the film as I imagined by illustrating those lines I needed nightime shots of the town, the woods and the estuary. So popping out for half an hour I wandered the streets at midnight, with a camera, feeling like a very suspicious character. 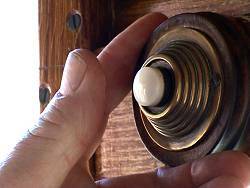 When I got home I wrote the script and realised that there were two problems. Dylans death is a crucial part of the story, highlighting his personal weakness for alcohol. However he died in New York. Luckily a colleague from Darlington Video Makers was going on holiday to America and agreed to film the outside of the hotel where Dylan died. 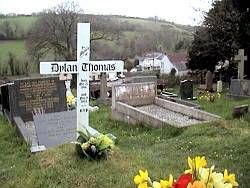 The second problem was Dylans move from Swansea to Laugharne which gave me his quote about a bus that is essential to the title of the film. It only needed a few seconds of commentary, suitably illustrated. What was important was the correct choice of words. My first draft said Dylan was born in the bustling streets of Swansea but went to Laugharne one day. The emphasis here is on the town and the images that fit that sentence have to reflect cobbled streets, bustling crowds, preferably in Swansea. Since I live too far to pop over to Swansea to take 10 seconds of film I thought about reconstructing the close up images of bustling feet on cobbled streets in my own town of Sunderland. Then I realised that if I changed the words the necessary images also changed. 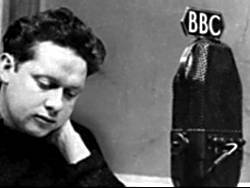 The final draft of the commentary now reads A bus trip to Laugharne from his home town of Swansea marked a turning point in Dylans life. 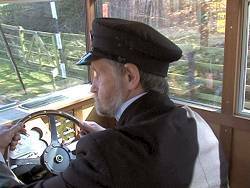 Now the emphasis is on the journey and needed images of an old fashioned bus trip, which I could easily recreate at Beamish Museum, only a few minutes from my home. Both the commentators voice and Dylans Welsh quotations were recorded by myself. However to make it easier I recorded all the Welsh accent pieces separately and then edited them into place. So there we have the sow's ear. A fascinating subject, some random shots of a family stroll around a fairly average looking town, some spontaneously planned night time scenes, some archive photos, some help from a friend on holiday, some artistic licence involving cheating locations, a poor imitation of a Welsh accent and some nice Welsh music. All I had to do was to try and make something like a silk purse !!! After the Bus Had Gone won a 4-Star Award and the Carlin Music Award at BIAFF 2011.